Let’s get down to brass tacks (and not of the Bronx type): for the past few months, the content on MetsToday has not been nearly as prolific as you remember. The reason for the relative lack of frequency in posts is simple: I started a new, full-time job that is taking most of my time. There is a significant learning curve as I get the lay of the land and figure out what the heck I’m supposed to be doing. This isn’t a complaint — I’m absolutely, positively thrilled to be working for Opici Wines (pardon the plug). And the good news is, I’m starting to “get it”, and will soon return to a more regular rhythm of posts here on MetsToday. In the meantime, to sate your reading appetite, I highly suggest — no, demand — that you head on over to AmazinAvenueAnnual.com and download the 2010 edition. I have been grossly remiss in not pointing you toward the Annual before today — but in all honesty, I did not have the time to give it a look-see until now. It is salaciously scandalous; refreshingly negative in tone, yet delivered with tongue planted firmly in cheek effusing biting humor that often spurs legitimate, doubled-over, laughing out loud (not to be confused with the ubiquitous “LOL” littered irresponsibly in billions of texts every minute of the day). But it’s also incredibly informative, chock full of stats and analyses that will impress the stathead … yet there are also numbers that are digestible by the old school crowd. And that’s a major point I’d like to communicate: contrary to what you may know of AmazinAvenue and the former “MetsGeek” staff, this is NOT a book expressly for Beaneheads. More correctly, it is a book for everyone. Where else can you find a great Mets drinking game based on quips by Gary, Keith and Ron? Where else can you read an homage to Lindsay Nelson written by a kid who was born five years after Nelson’s last broadcast? Where else can you read in-depth about “CHONE” and it have nothing to do with a certain Mr. Figgins? Where else can you find a journalist like Eric Simon using words like “rejoinder”, “mordant”, “trenchant”, and “intransigent” — all in one paragraph? If nothing else, Simon’s diatribes are an entertaining alternative to the Reader’s Digest “It Pays To Enrich Your Word Power” exercises. The bottom line is this: you should download this book (it’s FREE) and read it. Read it from front to back, backward, sideways, or just pick out some of the articles from the contents that tickle your fancy. I have absolute confidence that you will find SOMETHING worth reading in this tome — more likely, many things. And to be clear, this review is completely, 100% sincere. I am receiving no kickbacks nor special favors from the AA team, and in fact none of them even asked me to write a review. 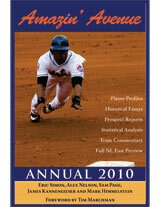 The Amazin’ Annual is better — hands-down — than any other Mets-centric publication that you would have to pay for. The only beef I have is that nowhere in the 340 pages of content, is MetsToday mentioned nor am I quoted. This wouldn’t be a big deal if Ted Berg hadn’t been quoted (and twice, no less!). I don’t care that Berg is one of the contributors of the book, and I don’t care that he is on the SNY staff — the guy’s website isn’t even a dot-com, it’s a “dot-net” for goodness sakes! How do you quote a dot-net wannabe blogging from his parents’ basement and not include a solitary quip from a legitimate website that happens to be one of the most abrasive and straightforward in the Mets blogosphere? I’m kidding of course … but not kidding about the Amazin’ Annual. Go get it before they realize what they have there and start charging for it. Enjoy.